Should we use emojis in customer service? Many of us use them in our everyday life and so do our customers. Here we look at the right and wrong ways to use emojis in the contact centre. Emojis, also known as “emoticons”, are visual tools that help to convey an emotion. They are often sent as small icons or digital images that assist the reader in better understanding the tone of an interaction. Some examples of emojis that you may be familiar with are shown below. Before advising the team on when is best to use emojis in business emails, live chat and even letters, there are two points to consider, according to Neil Martin, Creative Director at The First Word. 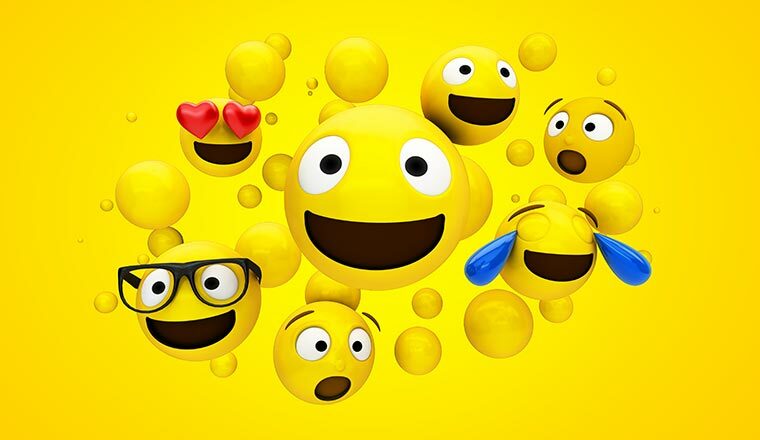 While some brands may have an identity that they would like to uphold or a customer base with a particular view on emojis, most organisations will have customers with opposing views on the topic. So, it’s good to have a flexible approach. One flexible approach is to use emojis as the customer does, as in this case you are aware that the customer is comfortable in using them. 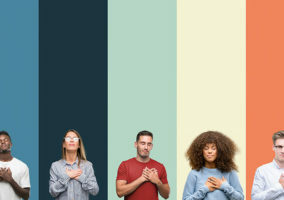 Using emojis in this way allows the advisor to demonstrate commonality with the customer, a key to building rapport in any kind of communication, as Christine Knott, the former Managing Director at Beyond the Box, tells us. With this in mind, mirroring the customer’s use of emojis can be a good tool for demonstrating commonality, something that’s harder to do on written channels than when using the phone. This is due to it being more difficult to match the customer’s tone and because there may not be the immediate response that you would expect on the phone. Although choosing to use emojis may seem like quite a simple decision, there are many things to consider. 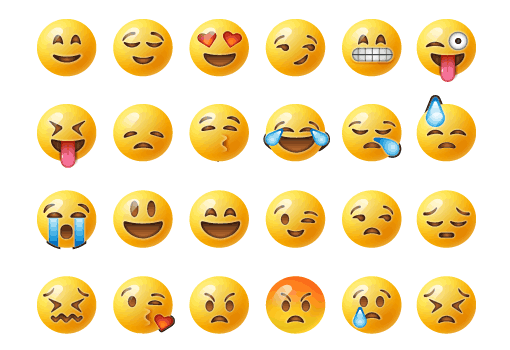 For example, will the customer understand which emotion your choice of emoji conveys? This can happen when you go beyond smiley and unsmiling emojis. 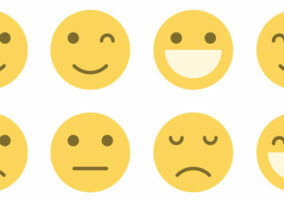 A single unhappy emoji can be useful to visually express your empathy. In written communication, it is much harder to communicate with an empathetic tone, so careful use of emojis can be a helpful tool. Customer – I preferred my old deal, I’m finding this so inconvenient. The second example feels “softer” and more human. It is a good example of how emojis can visually communicate empathy, which is otherwise tricky to do in written communication. However, remember – as Neil said – to avoid overusing them, otherwise you risk sounding inauthentic. In negative circumstances, it’s also important to only go as far as an empathetic unsmiley face as shown above. An eye roll emoji or a “sick face” emoji could be really inappropriate. Even in positive circumstances, overusing emojis can be called into question. While it may feel natural to an advisor, as it’s how they would communicate with a friend, some will consider it unprofessional. To avoid seeming unprofessional, let’s go back to Neil’s principle of reflecting back the customer’s use of emojis; we want to use them how the customer sees best fit. When we open the conversation, we likely do not know how the customer sees best fit, so it’s best not to start with an emoji, unless it really goes against your brand image. If they refer to themselves by their first name, use their first name. If the customer uses a smiley emoji, give them one back. Remember that every customer is different, so start by being polite and friendly and go from there. Some emojis are more appropriate to use than others when providing customer service. So, here’s a set of ten emojis that can help to improve a customer interaction, if used wisely. While these are all good examples of how to use emojis well, be careful when employing them, as they can give off a “sarcastic” tone, which can ruin the experience.  – It’s best not to use this emoji as it implies that you are teasing the customer. While many customers wouldn’t necessarily mind that, it’s a risky game to play.  – This emoji could only logically be used if either you or the customer has made a mistake. So, avoid this one, as you want to focus on the solution not the error (after the apology, of course) and, if it was a customer mistake, you don’t want it to seem as if you are mocking them.  – A poop emoji in the business world? No. Just no. Which Channels Are Best Suited For Using Emojis? While we’ve discussed emojis very generally so far, there is also the question of which channels lend themselves best to them. As less formal platforms than emails or letters – social media, live chat and messaging apps are well suited to emojis, as both are modern innovations and are void of any formal preconceptions. With this in mind, customers may react more kindly to emojis on these channels – but as previously stressed, it seems best to let the customer lead. Although, if a live chat, social media or messaging advisor is having a “fun” conversation with a customer who uses lots of emojis, they could even share a gif or a meme with them. This can bring more humour into the interaction and make the experience even more memorable. Should “Emoji Use” Be Part of Your Quality Assessment? While some may think of emojis as light-hearted fun with no real impact on the quality of an interaction, Neil Martin disagrees. They can have a significant impact on Customer Satisfaction (CSat). For this reason, I think it’s important to include them in Quality Assessment (QA). 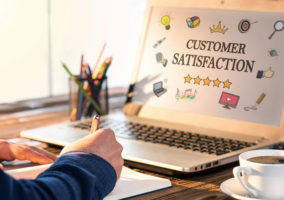 However, as our recent research suggests, many contact centre build their quality scorecards without consideration of CSat, with only 33% of contact centres reporting a good match between their quality and CSat scores. So, with this in mind, go out there and talk to your customers and get your customers’ opinions on how much emojis matter compared to other elements on your scorecard. While they may not mean as much as overall courtesy, advisor knowledge or even the contact outcome, the results may surprise you. Emojis are a way of demonstrating emotion, which can otherwise be quite difficult to do on written channels in the contact centre. However, customers will likely either love them or loathe them, so it is generally best to let the customer lead and for the advisor to mirror their usage of them. Also, just remember to avoid overusing emojis and opening a conversation with one. After all, you are unlikely to have much information about the customer’s preferences about them.